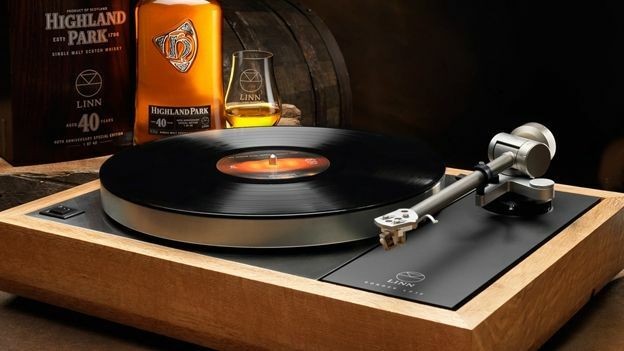 Linn has teamed up with renowned whisky makers Highland Park to create a special edition Linn Sondek LP12 vinyl turntable using Spanish oak casks as the main building material. Known as the first product Linn ever made the LP12 was designed by founder Ivor Tiefenbrun. Remaining unchanged in its design since its creation in 1972 the LP12 features Linn's patented low-noise, single-point bearing creating an ultra-smooth motion thus drastically reducing distortion of the record. Where the Special Edition differs though is in the solid wood base. The limited edition will feature Spanish oak which comes from Highland Parks very own whisky casks. According to Gerry Tosh, Global Marketing Manager for Highland Park the Spanish oak casks add a particular density to the design thus ensuring an even more stable system helping to reduce distortion and increase the sound quality. Just in case you were wondering the LP12 does come with a limited edition 40 year old bottle of Highland Park which has been given a custom design. How much for this pairing of wood and whisky you ask? Well Linn are only making 40 of these models with each one costing £25,000 each so really this is for, at the very least, an enthusiastic whisky-lover.